Cook bacon in a sauté pan. Once bacon is cooked, remove it from pan but keep the fat. Melt brown sugar in the pan to form a caramel. Add the bacon to it and mix. Set on a parchment-lined tray to cool. Then, chop the cooled bacon into pieces. Wash and dry the apples. Insert a stick into the top of each apple and set aside. Place caramels and cream in a microwave safe bowl and microwave for 30 seconds on high. Stir, then microwave again for 30 seconds. Stir until caramel is smooth and drippy. Dip each apple into the melted caramel, then place on parchment paper and freeze for 5–10 minutes to help the caramel set. Melt semi-sweet chocolate in the top half of a double boiler. Remove from heat and stir until smooth. 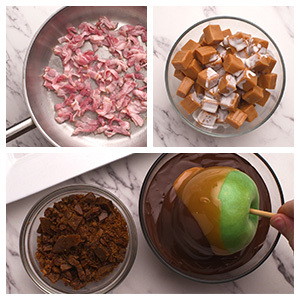 Dip apples into chocolate, then immediately roll in bacon bits to coat the outside of the apple. Place back on parchment and into the freezer to cool for 5 minutes. Enjoy your apples as is, or try topping your bacon chocolate caramel creation off with some melted white chocolate.